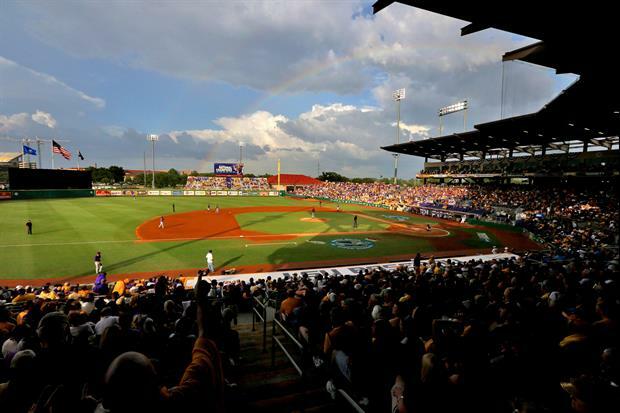 The Yard at Alex Box Stadium will operate in much the same way as The Chute at Tiger Stadium. Fans ages 21 and over can purchase a wristband at either location or near the grandstand entrance gates. The wristband is $20 and includes two beverages. Additional beverages can be purchased inside the premium area starting at $6. Fans who purchase a wristband will have access to both locations of The Yard. Due to Southeastern Conference regulations, all sales must be consumed in the tented area. The left and right field locations will open two hours before first pitch. Beer and wine sales will end at the close of the 7th inning. They should have called it the Geaux Yard..
Can you see the game at all from the Yard? Most important question. screw the SEC rules. let us drink in the stands like every other conference gets to do. I agree. This rule by the SEC is just stupid.